The CR Way: Using the Secrets of Calorie Restriction for a Longer, Healthier Life is written by Paul McGlothin and Meredith Averill who have practiced Calorie Restriction for over fifteen years and are the leaders of the Calorie Restriction Society. It is based on the scientifically supported concept that by restricting calorie intake while maintaining optimal nutrition we can extend our lifespan and avoid the diseases commonly associated with aging such as cancer, heart disease and diabetes. The general concept of this dietary approach is to cut back on calorie intake by about 20% of your normal requirements. The authors say that this will enhance longevity as well as result in improved health outcomes. In order to make this easier you will concentrate on foods that are high in fiber and have a low glycemic index such as green vegetables, whole grains and fruits. These foods have a high volume and nutrient density in relation to their calories so they help you feel satisfied more easily. The authors emphasize that calorie restriction is not the same as semi-starvation because it concentrates on giving the body the nutrients that it needs. The goal is to nourish your body as close to optimal as possible using foods that are delicious, whereas in contrast, semi starvation involves deprivation. While most other books on longevity diets are often very scientific or technical, this is a practical guide that will outline a clear program for you to follow. The The CR Way includes a meal plan as well as a selection of low calorie, nutrient-dense recipes. Salmon, lentils, beans, cabbage, broccoli, collards, spinach, sweet potatoes, blueberries, strawberries, walnuts, olive oil, quinoa, sprouted bread. This Calorie restriction diet promotes regular, moderate aerobic exercise for its benefits for heart health. Muscle strengthening and weight bearing exercises should also be performed at least twice a week to reduce the risk of osteoporosis. Intense exercise is discouraged because when combined with calorie restriction this can place extra stress on the immune system. The CR Way: Using the Secrets of Calorie Restriction for a Longer, Healthier Life retails at $15.99. May increase longevity and reduce risk of diseases associated with aging. Can assist with the management of high blood pressure, heart disease and diabetes. Most dieters will easily lose weight when calories are consistently reduced. Provides different options depending on personal preferences for how strictly you would like to follow the diet. Not suitable during pregnancy or for teenagers. Most dieters will experience some degree of hunger. Will be difficult to eat out and in social situations. Some dieters may lose too much weight. Some dieters have reported persistent fatigue and feeling cold when calories are restricted. May increase the risk of osteoporosis. 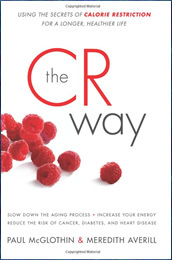 The CR Way will appeal to readers who are interested in learning more about how to enhance longevity by making dietary adjustments. This book can help to answer common questions and concerns about calorie restriction and provides clear guidelines that will assist you to follow this program as a long-term lifestyle.